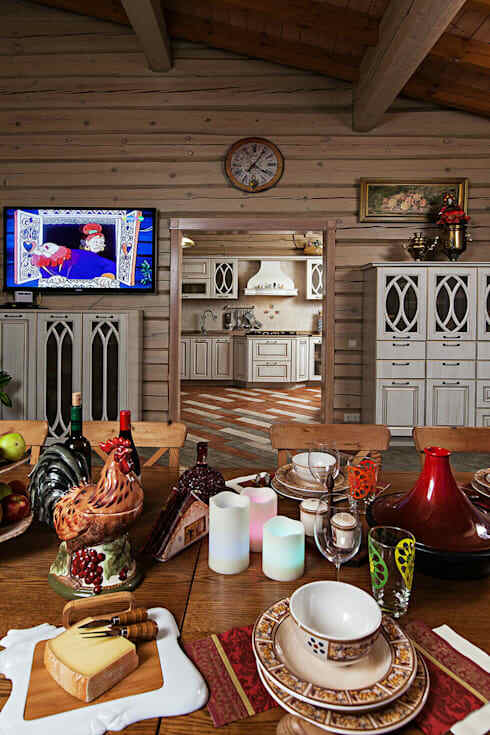 If you've never seen a Russian country log home, you are in for an unusual treat. 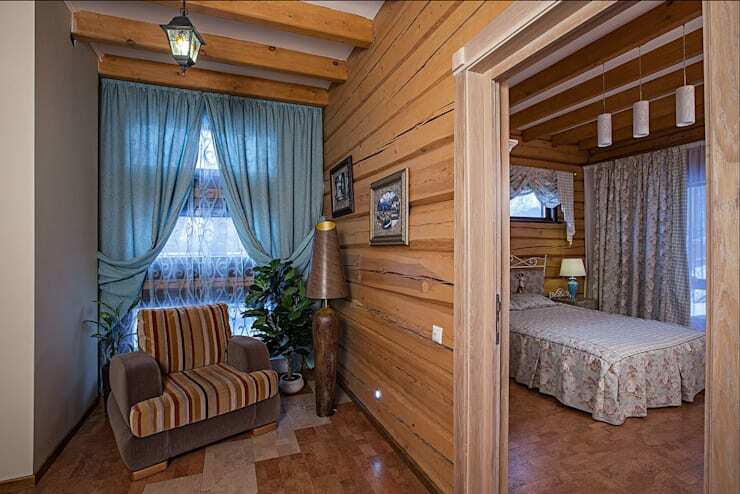 For ages, Russian homes kept to simple and logical rectangular floor plans, and steep chalet-style roofing. 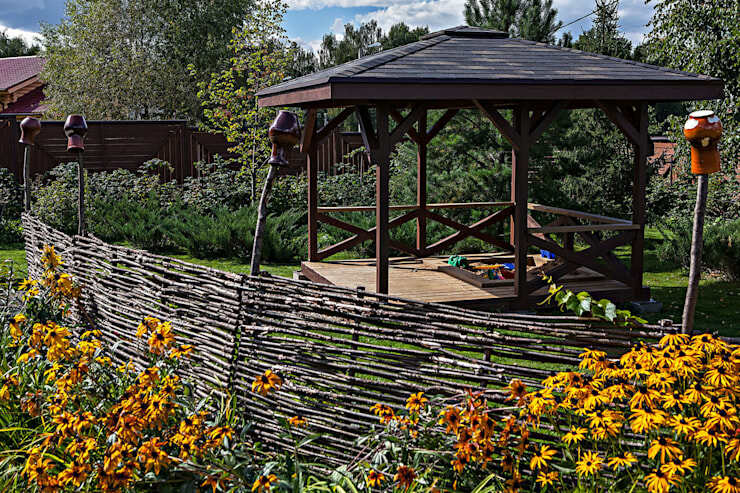 The exterior was made of local logs and extra attention was paid to the corner joints. 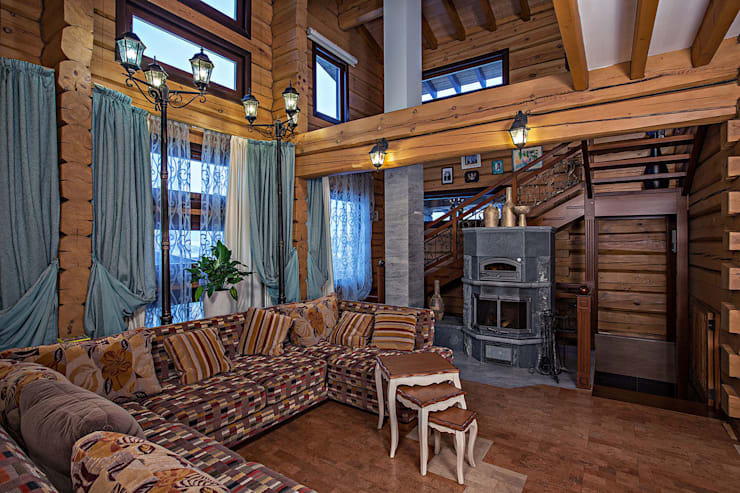 Now, there are over fifty traditional corner styles used for these log homes. 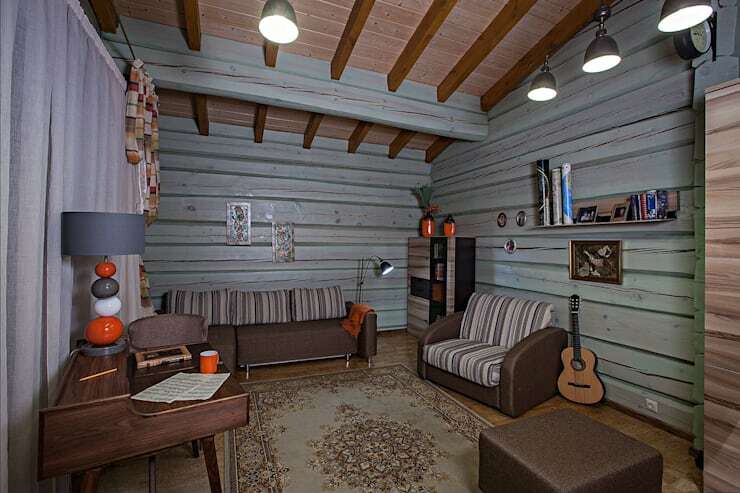 And, the copious, detailed interior decor is still brimming with country life and personality. For all of these reasons, there is so much inspiration to be found in these houses. But, they are quickly vanishing from the landscape, being replaced with more modern-style buildings. Photographers have captured one of these traditional beauties, which has been outfitted with more modern luxuries than you'll believe. 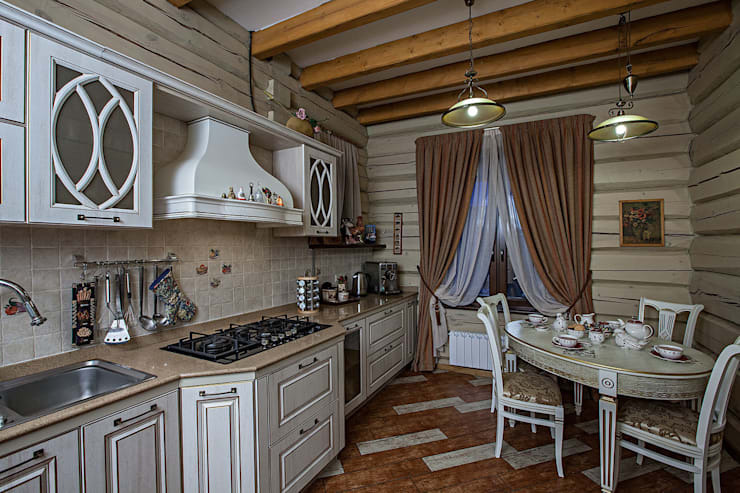 This is a great starting point for reviving these artful homes, or taking some inspiration from Russian culture into your home. Let's take a look! 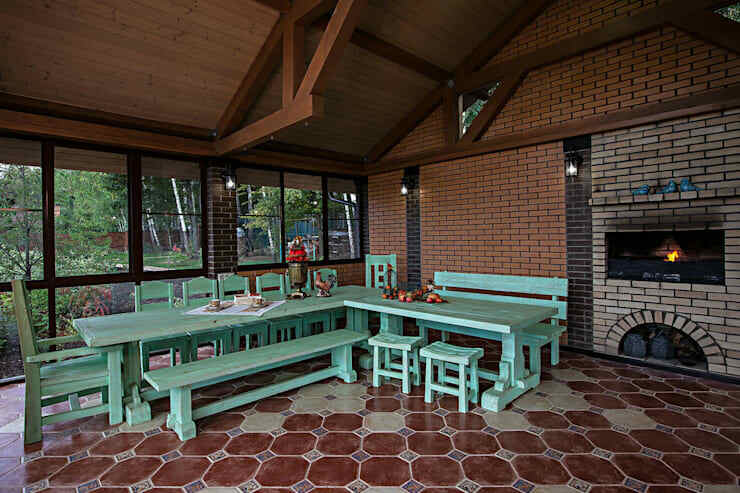 Tradition is kept in this house with the peaked and unique roof, but modern elements are added in with brick corners and feminine decor. 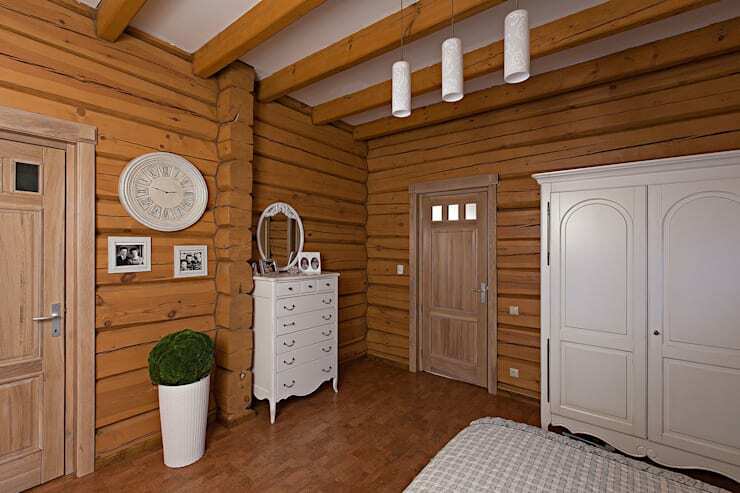 From the moment you walk in the door you can see how the emphasis on natural wooden materials blends with a white, feminine, country aesthetic. When you need heat in this home could use the ancient iron stove in the center of the main floor. Light is provided by gorgeous lampposts. The high ceiling trend continues into the dining room, and the walls here are washed out. The room feels both more modern and more spacious. What could be more comforting and classic than this table spread? The roosters stands out, to us, as the focal point of the decor, and boy is he cute! 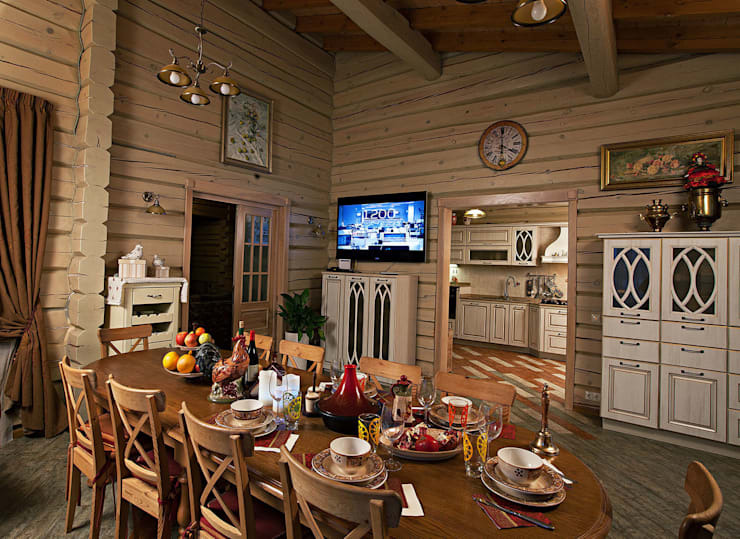 When you think country you think kitchen and Russian style log homes are no exception. The feminine chair, feminine range hood, and the detailed cupboards are all so unusual, and chic. There's so much lounging room in this house, we haven't even scratched the surface yet. 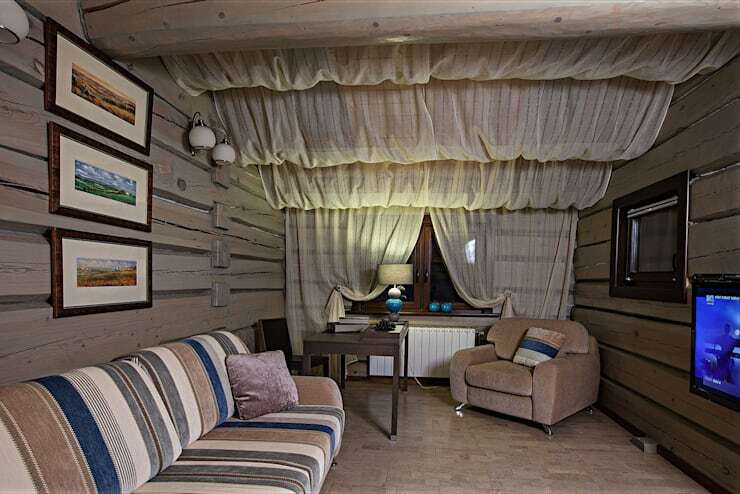 This first side room has flowing curtains on a whole side, making for a comfortable atmosphere. This lounge space is a sweet blue, and emphasizes unusual textures, from the ceiling to the traditional rug. Ready for a peek upstairs? First, take a gander at the amazing collection of decor here. Keeping everything in straight lines is preventing the space from feeling cluttered. The sitting space outside of the first bedroom looks so soft, and combines the light blue and brown patterns we've seen elsewhere. 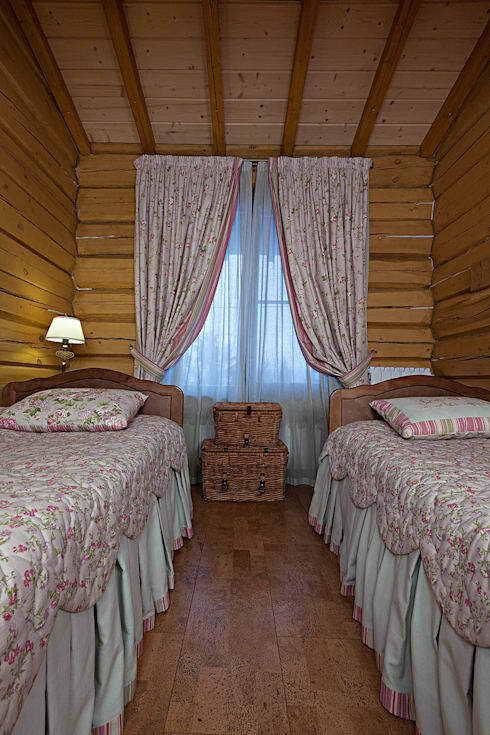 This bedroom is every young country girl's dream, with pink quilts and woven baskets. 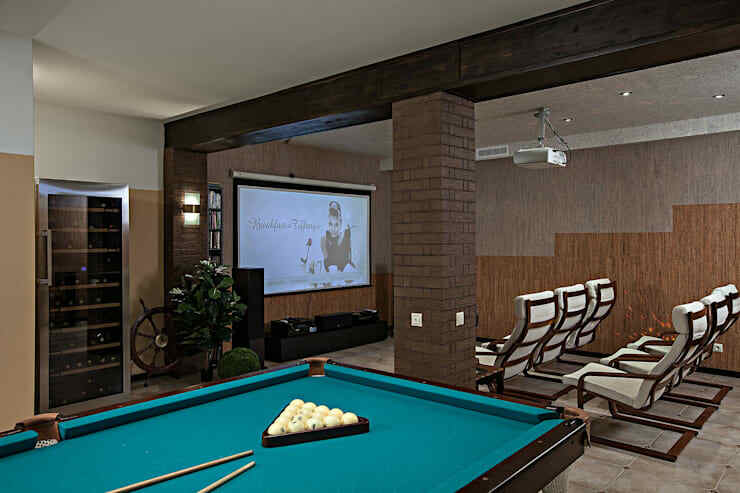 Can you believe there is such a modern and spacious cinema/game room area in the basement of this log home? 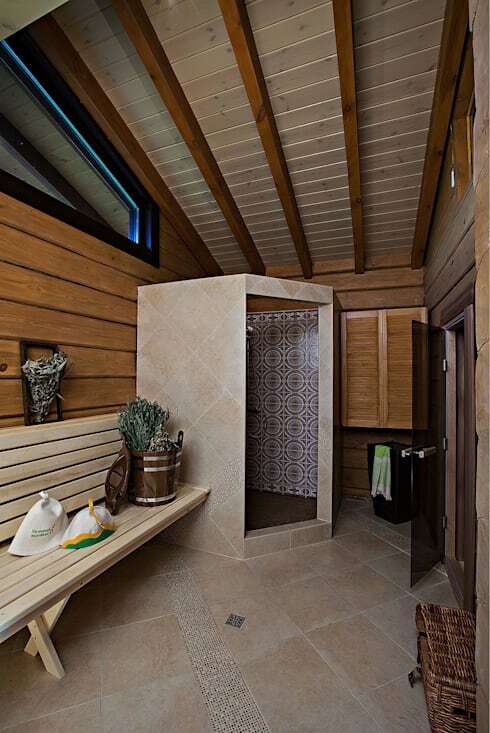 There's another more modern space in this bathroom, and if you follow the marbled floor to the right you'll even find a sauna. This dining space is housed in a whole other building, just off the main house, surrounded by some amazing gardens. We admit-- we want one! 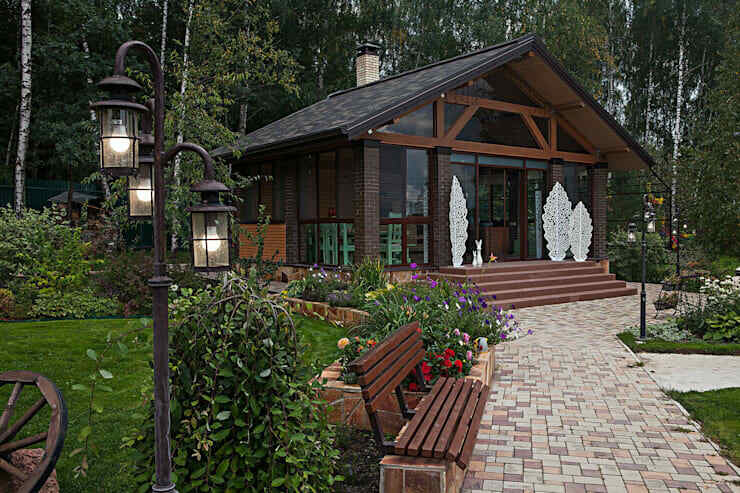 Our last stop on this tour is yet another amazing entertaining space, this one outside, making full use of Russia style roofing and the ample garden space. 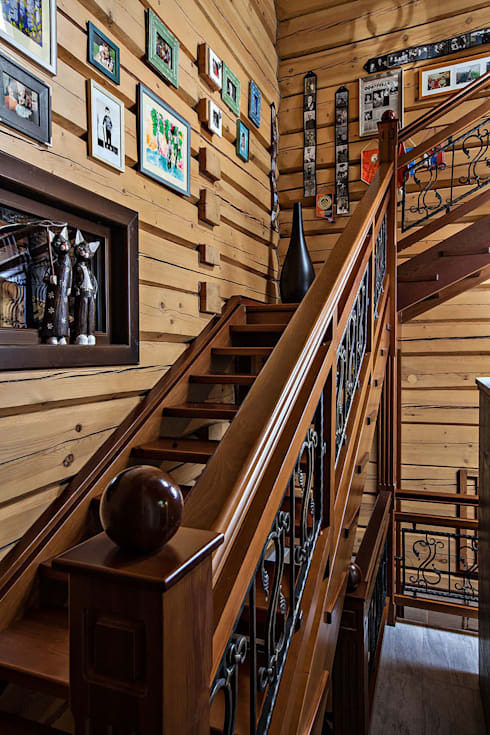 You can find another unique home with an interesting roof, amazing wood finishes, and tons of character, right here.